All non-profit organizations have a common goal: raise as much money as they can to support their cause. Whether they are looking to raise awareness, solve a problem, support those in need…all nonprofits need money to achieve it. So aside from working toward their mission, which takes time and manpower, they need to dedicate time to raising the funds to achieve it. Not many nonprofits have the spare manpower nor time and are outsourcing this necessity. Is your non-profit considering using a professional fundraiser? Here are 5 reasons we think it is a good idea! Focus on YOUR mission. Chances are your staff and volunteers are passionate about the organizations mission, which is why they are a part if it. They are likely willing to do whatever it takes to help achieve that..including fundraising. However, the reality is their time is best spent on the actual mission and not making fundraising calls, writing thank you letters or processing donations. Harness the passion of your manpower and involve them in work where their efforts will have a positive impact on the overall mission. Shared Technology. Technology is ever-changing in any industry, including fundraising. New software is constantly being introduced to improve fundraising. To stay current, it takes cash and expertise most nonprofits don’t have to spare. By partnering with a professional fundraiser, you get the benefit of using the technology they have already invested in. Proven Results. Effective processes take years of trial and error to perfect. Who’s got time for that? Professional fundraisers have the expertise and proven methods nonprofits can take advantage of. While there is still some learning curve depending on factors including the target demographic, it is greatly reduced when partnering with an established outsourcing provider. As a result, nonprofits are likely to achieve their fundraising goals in a shorter amount of time with far less effort. Cost Reduction. 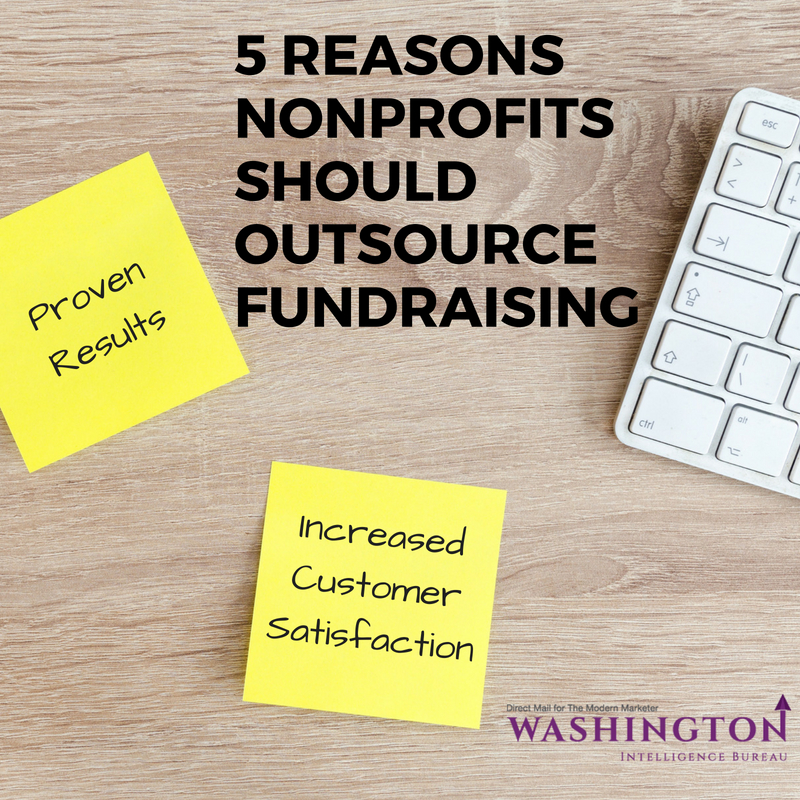 There is an inherent cost involved with fundraising for nonprofits. Capital and operating expenses, such as training, technology, staffing and not to mention the multitude of soft costs associated with fundraising, can quickly add up. As a result, the amount raised is lessened to cover these necessary costs. Partnering with a professional fundraiser comes with cost, too. However, typically the elimination of operating costs and the time and manpower saved from handling fundraising management in house far outweighs the cost of hiring a 3rd party organization. Increased Customer Satisfaction. Donors are an organization’s customers and deserve to be treated with care. They should feel special from the first piece of marketing material to the thank you note and beyond. If they aren’t they are likely to be one-time donors. If they are, they could likely donate multiple times and increase their gifts over time. Though your organization may have the best of intentions, the manpower required to provide gold standard customer service is often unavailable leaving important tasks undone. A professional fundraiser has the necessary manpower to reduce the turnaround time to respond to prospective donors inquiries and getting thank you’s to donors after a gift is received. These acts may seem small, but appear more personal to the donors and thereby improves their overall experience with your organization. Happy donors tend to be more generous! Whether your organization opts to handle fundraising in house or partner with an expert, there is the business of handling the donations to contend with as well. Efficiently processing receivables and ensuring they are accounted for properly is a job in of itself that requires time, technology, efficiency and of course, manpower. There are lots of advantages to outsourcing this piece of the fundraising process, too. We’ve shared the top ones in a previous blog post. Does your organization outsource any part if the fundraising process? We’d love to hear how it’s affected your campaigns. Share your thoughts below of leave us a comment on our Facebook page.